This week marks my fourth piece on deck archetypes, and it looks to be the most fun. Digging for specific answers with Serum Visions has taught me to be goal-oriented in other areas of my life. So with the basics laid out, we’ll focus on my favorite part of the theorizing process: application! We all know I can’t go one week without at least referencing a Draw 7! The pink lines and dots represent specific Tempo decks, and the gold ones represent Midrange decks. We’ll look at sideboarding decisions for two different matches: Monkey Grow (Temur Delver) vs. Merfolk, and Jund vs. Blue Moon. In this article, I use Aggro-Control hybrid archetypes (Tempo and Midrange) to explore the many options these decks have, and omit Combo decks, which frequently inhabit another axis entirely*. The lists here are stock, and relatively recent; I by no means consider the builds of the decks (or the decks themselves) tournament viable (looking at you, Blue Moon!). I’ve chosen these lists because they do a straightforward job of representing their archetypes, which should help readers understand the theory and apply it to other decks and matchups. *In general, the blue-line Tempo decks beat up on unfair strategies, including Combo, while the green-line Midrange decks beat up on fair strategies, including Tempo and Aggro decks. By the third turn, Monkey Grow has drawn at least four new cards, so the lines become muddled after that. But this opener definitely affords pilots the possibility of playing aggressively. The free disruption from Disrupting Shoal helps ensure that Merfolk can’t race seven evasive points of damage. Merfolk’s game one plan won’t do it many favors against the newly assembled Huntmaster deck. Against a green-line Midrange deck like Huntmaster RUG, Merfolk wants to get as far away from the blue line as possible. With all their creatures, the fish simply don’t have the tools to approach the black Control dot that would trounce Control Rock. Their best bet is to get even lower to the ground and closer to the red Aggro dot, cutting cards like Spreading Seas for additional threats. I want to remove all of Merfolk’s threats, and an increase in threat density across the table complicates my doing so. I win most of my Merfolk matchups with this deck, since Merfolk players (most players?) aren’t very familiar with Monkey Grow and sideboard incorrectly. But those that correctly anticipate my switch to Midrange can tempo me out. Naturally, the best Tempo tools elude Jund pilots: there’s no Mana Leak or Stubborn Denial in Golgari colors! Still, Tarmogoyf is a perfect early threat against Blue Moon, since he’s hard for that deck to interact with. Decay and Bolt are strong disruption pieces that come down after the Goyfs begin their assault to mess with Vedalken Shackles, Sower of Temptation, or whatever else Blue Moon might employ to quell the beats. This draw might crush Aggro decks, but it doesn’t stand a chance against Blue Moon. 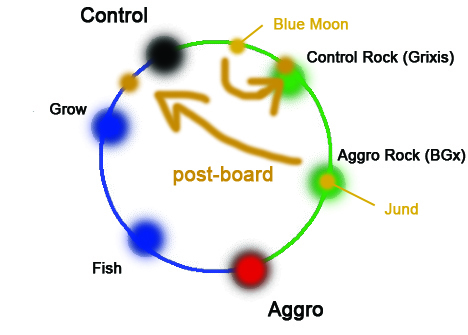 Looking back at the spectrum, it plants Jund firmly on the green Rock dot, a position predated by the more controlling Blue Moon. While an unanswered Confidant can provide a stream of cards, he’s unlikely to survive against a Bolt-Snap-Bolt-Electrolyze deck. When two Midrange decks draw openers encouraging them to trade cards with opponents, the clockwise rule can be observed in full, and whoever comes first in the circle gains a huge advantage. If Jund moves towards the red dot, it also moves further away from the Blue Moon deck on the spectrum. Sure, it’s not getting behind Blue Moon, but at least it’s not directly in front of it. I’d say Blue Moon still has the edge in this game, but Jund will do a lot better than with the previous hand, since this time it can operate organically as an Aggro deck. Blue Moon’s on-curve Keranos, God of Storms means much less if it requires tapping out at 8 life when Jund has a creature, a manland, and who knows how many Lightning Bolts. The second Jund hand also has a little bit of play to it. Pilots could cast Goyf, Confidant, Command, and Huntmaster on-curve before animating Ravine on turn five. Against more aggressive decks, Jund would probably prefer to play its hand out like this: Goyf, Kolghan’s Command, Huntmaster of the Fells, Dark Confidant (+ Treetop as a blocker). But against Blue Moon, Jund might even (barring a telegrtempoaphed Lightning Bolt) attack with Treetop Village on turn three. This approach lets Kolghan’s Command double as a virtual “extra threat,” bringing back deceased beaters when Jund starts to run out of steam. It also affords Jund extra points of damage. BGx isn’t a deck that usually likes trading mana or cards for damage early on. Still, playing things slow does little for it here, since Blue Moon stands to gain more from drawn-out games – Keranos will actually beat Jund players who don’t frontload enough pressure. We talked about the possible lines with Jund’s “Aggro” draw against Blue Moon. The sheer variety of possible play options Jund boasts, even with standard openers as shown, explains its unquestioned strength in Modern. The same can be said of Twin. Decks with cards as flexible as Jund’s and Twin’s (among them, versatility lynchpin Lightning Bolt) can play a host of roles depending on the matchup, and by extension, move the largest distance forwards and backwards on the archetype circle. More linear decks like Mono Green Stompy, Burn, and Ad Nauseam might do well in certain metagames, but they have trouble shifting locations on the archetype spectrum. Moving fluently around the circle, an ability almost entirely exclusive to Twin in Modern, gives a deck immeasurable adaptability – and with it, viability. I call this ability spectrum fluidity. Taking a look at the diagrams above, Merfolk and Blue Moon obviously have less spectrum fluidity than Monkey Grow and Jund. In this case, like in many others, the decks with higher spectrum fluidity become favored after siding. Going into open metagames, decks with high spectrum fluidity almost always make decent choices. That’s why so many pros favor Jund and Twin at big-ticket events. Linear decks tend to have low spectrum fluidity. If you’re planning on playing Burn or Infect at GP Oklahoma City, your focused strategy will toss you some free wins. But those come at the cost of ceding a fighting chance to better-rounded decks that draw their disruption. I’ll close by reiterating the lesson from my pal Serum Visions. Being goal-oriented is key to using the archetype spectrum wheel to your advantage. Players who visualize the wheel and can adequately gauge the section their opponents play on can make optimal choices both during and between games. I like the idea of this article and I think your axes are well defined, but I have some quibbles regarding the Grow v. Fish matchup. I’m wondering what exactly Merfolk players sideboard against you to make you consider them more of an aggro deck post-board. Personally, if I see the likes of Goyf and Mandrills in a Delver shell, I’m going heavy on the control side – Tidebinder Mage to control those green creatures, Kira (and possibly Spellskite) to ward off removal, as well as Chalice of the Void to stuff all that 1-mana cantrip spam. Spreading Seas goes to the board because you already have Islands, Harbinger of the Tides goes to the board because Tidebinder’s effect is better, and Spell Pierce goes to the board because Chalice will have a more consistent impact. That may result in more creatures in your 60, but I wouldn’t say the deck is more of an aggro deck because of it. Actually, I don’t think they side properly against me, as I said in the article. If they moved closer to the red dot by increasing their threat density (with Harbingers, Tidebinders, etc.) the post-board matchup wouldn’t be such a cakewalk for my Huntmasters. I’m just saying that that’s how they SHOULD side in the matchup. I usually see a lot of Skite and Kira from them, which matches the description of how you’d board. This sideboard plan never works against Monkey Grow. We have plenty of artifact removal post-board, so Skite is horrible, and Kira opens Merfolk up to Pyroclasm blowouts (unless I need to, I’ll save Pyro for her). Chalice also doesn’t bother us much since we have interaction for it and it gives us more time to get Huntmaster online. Plus, we run significantly less one-drops post-board. I would disagree with your notion that Kite is bad, because even if artifact hate comes in, anything that targets it usually can’t take Chalice or AEther Vial along with it. A Kite dying to hate in place of those isn’t a terrible outcome, and it combos well with Kira. Pyroclasm also isn’t too concerning as a Merfolk deck, since it’s quite easy to hold Cursecatchers up for it and/or get your Lords to the point where 2 damage only kills Kira. All in all, I’ve never really had problems with any deck that runs Islands as Merfolk, and Delver is no exception. REMOVE 4 Spreading Seas + 2 Spell Pierce + 2 Reejerey. Seas doesn’t do enough as Roland mentioned, since you already run Islands. Spell Pierce really only cares about removal and dispel is better for that anyway. Reejerey just usually gets cut to make room for better stuff. ADD 3 Tidebinder + 2 Relic, + 1 Dismemeber + 2 Dispel. Tidebinder is just an auto include against any deck looking to swing with green or red creatures, as it’s a classic 2 for 1 if not removed. Relic goes in against pretty much any deck it’s relevant against it because it can have an impact and be easily cycled. Dismember hits all your creatures (including the dreaded hunt master) and dispel is great at protecting high value creatures (usually lords). So really the deck just cuts chaff to become more responsive, the goal being to kill or bounce the opponent’s creatures and counter the odd threat to buy yourself time to build a board state and swing for lethal. Honestly, the preboard Merfolk is already pretty aggro so it’s very difficult to go even further down that path. I might be missing something here though. Would you consider that sideboard more aggro? Is that how you would sideboard as fish? I was just writing how I think ‘Folk decks should sideboard against Monkey. In the article I state that most of them don’t side this way and the matchup becomes very easy for me as a result. This article is more about theory and the ‘Folk thing was just an example; it’s not a Merfolk vs. Monkey Grow primer. 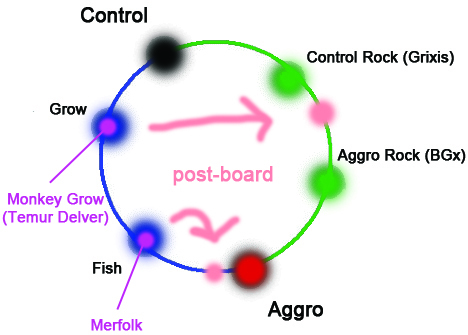 I also explained that Combo was on a different wheel in my last article.